Charitable Words Scholars come from many areas of study and interests, sharing a passion for purpose. Volunteer advisors engage with their experience, expertise and connections to pro bono resources. 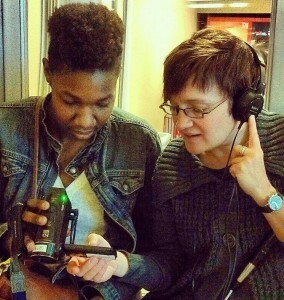 Charitable Words Scholar Elese Daniel and Advisor Elissa Yancey, checking audio levels on a documentary project. The nation’s 1.8 million nonprofits are the fastest-growing sector of the economy, representing 10% of the U.S. workforce. They are often underfunded and understaffed – and investments in communications and marketing to do more, reach more are (unfairly) seen as “overhead”. Students, facing a college debt bubble, are ready and willing to learn and lend a hand. Volunteer professional advisors and pro bono connections enrich experiences and outcomes. A generation engaged in giving, but facing a debt bubble. They face a 50% chance of finding a job upon graduation. Internships greatly increase the likelihood of employment. Four of five graduates remain in the region of their internships, giving back to their community and economic region. Volunteers and pro bono services are waiting to connect. 90% of managers report employees display stronger leadership skills after participating in pro bono service. Yet only 16 percent of companies offer volunteer opportunities. 7 of 10 nonprofits could use pro bono services, but don’t know where to find them.